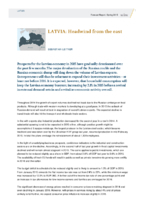 Prospects for the Latvian economy in 2015 have gradually deteriorated over the past few months. The major devaluation of the Russian rouble and the Russian economic slump will drag down the volume of Latvian exports. Entrepreneurs will thus be reluctant to expand their investment activities – at least not before 2016. It is expected, however, that household consumption will keep the Latvian economy buoyant, increasing by 2.1% in 2015 before a revival in external demand sets in and revitalises economic activity overall.